England 8-316 (Jos Buttler 71, Ben Stokes 70, Ian Bell 55, James Faulkner 4-67) beat Australia 259 (Aaron Finch 108, Glenn Maxwell 26, Ben Stokes 4-39, Tim Bresnan 3-45) by 57 runs. The visitors hammered 316 runs for the loss of eight wickets in 50 overs and the hosts managed 259 with 14 balls still available. Ben Stokes (England) was declared ‘Player of the match’ for his superb all round execution in the game. The fourth One Day International of the five match series was played on Friday, January 24, 2014, at Western Australia Cricket Association Ground, Perth. Earlier George Bailey won the toss for the Kangaroos and opted to chase. Alastair Cook, the skipper of England provided a rising start along with Ian Bell by smashing 87 runs in 12.2 overs. The first was gone for 44 and was replaced by Ben Stokes whereas Bell reached his 29th ODI fifty with a boundary. Ian Bell departed at 138 after scoring 55 and Stokes kept on pushing the score with small partnerships. 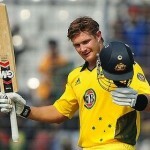 The latter got his maiden ODI half century and became the fourth victim at 206 for 70. The tourists were 5-216 in 38.6 overs when Jos Buttler took over, punished the Aussies bowlers and powered his third ODI fifty on the 34th ball. He was finally dismissed for 71 off 43 mere deliveries with 4 huge sixes and 6 fours as England piled up 8-316. James Faulkner was the highest wicket taker with four whereas James Pattinson, Nathan Coulter-Nile, Glenn Maxwell and Daniel Christian shared one wicket each. Australia went down by one wicket at 46 when Matthew Wade associated with Aaron Finch. The latter was the most attacking of the two, went past his fifty in the 17th over and Wade surrendered his wicket at 110 for 23. The middle order batting revolved around Finch who kept on cruising and thrashed his third ODI hundred in the 31st over. He was the fifth home batsman who went back to the pavilion at 189 after contributing 108 off 111 balls comprising 4 lofty sixes and 8 fours. 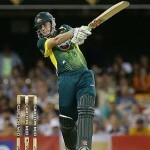 The innings of the entire Australian side was rolled back for 259 in 47.4 overs. Ben Stokes was the star performer with four wickets, Tim Bresnan held three, Stuart Broad got two and Ravi Bopara chipped in with one wicket. England clinched the fourth ODI with a margin of 57 runs but Australia still leads the series at 3-1.